Funding commitments of more than £300m have been announced for the Borderlands Growth Deal. 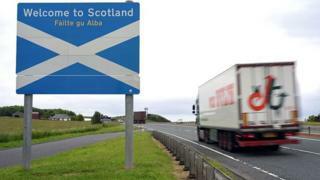 The Scottish government first revealed backing to the tune of £85m over a 10-year period. In his Spring Statement, Chancellor Philip Hammond then unveiled a UK government commitment of £260m. The proposed deal covers the council areas of Dumfries and Galloway, Scottish Borders, Northumberland, Cumbria and Carlisle City. Scottish Infrastructure Secretary Michael Matheson said he was delighted to confirm the Scottish government's level of support. Mr Matheson added that alongside the establishment of a new enterprise agency and the work of the South of Scotland Economic Partnership it could deliver "significant and lasting economic benefits". Mr Hammond also announced a major financial commitment to the deal. He confirmed £260m would go towards the Borderlands in his Spring Statement. A statement from the Borderlands Partnership said the funding could be a "game changer" for the area. "Now we know how much we're getting overall, we can start planning the detail to be able to deliver a range of projects across the region, all designed to boost productivity and to achieve inclusive growth," it said. "What is already clear is that the long-term benefits will reach all parts of the Borderlands." Scottish Secretary David Mundell said it was "fantastic news" for the region and would help existing businesses and encourage new ventures. "It is an ambitious approach to cross-border working between governments, local authorities and partners and I'm confident that together we can create jobs and opportunity and bring investment," he said. Elaine Murray - the leader of Dumfries and Galloway Council, one of the local authorities involved - said the investment would help its strategy to tackle the challenging economic climate. "We are part of a unique area which has an untapped potential for growth," she said. The idea of the growth deal across the Scotland-England border first surfaced in Mr Hammond's budget of 2017. Since then, the councils involved have formed a partnership to make the case for the investment and how it might be spent. Late last year they submitted proposals to the UK and Scottish governments with multimillion pound plans to "transform the economy". Among its main goals was also to look at the feasibility of extending the Borders Railway beyond Tweedbank to Carlisle. Berwickshire, Roxburgh and Selkirk's Conservative MP John Lamont welcomed the funding and called for a study into taking the route further. However, South Scotland Labour MSP Colin Smyth said the area could be left "short-changed". He said the funding fell short of the more than £400m councils had wanted and meant an allocation which was lower per person than other similar deals. Show me the money has been a common cry since a Borderlands Growth Deal was mentioned in the chancellor's budget nearly a year-and-a-half ago. It was nice to get a name-check for southern Scotland and northern England but a concrete financial commitment was required. Now that has been delivered by both UK and Scottish governments and - although some might quibble with the amount - it is still a significant sum. Last year a conference in Dumfries was told to "put up or shut up" in making the case for the area. It now has the promise of the financial clout to at least start delivering on hopes to transform the cross-border economy.